Aubree Marchione and Nick Scott competed at the Atlantic Coast Championships on Friday June 4, 2010. Their athleticism, precision, choreography, and connection lead them to win first place. They also took first place at the Heart of American Dancesport Championships the following August. Above: Nick and Aubree perform for guests at the Philadelphia Festival Championships. TLC Documentary - "The Girl with Tiny Legs"
From February 19-21, 2010, Aubree was in Kansas training Groovability, a wheelchair dance troupe, with the U.S. 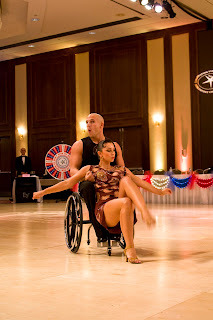 Wheelchair Dance Association. TLC filmed the entire workshop for their new documentary, "The Girl with Tiny Legs," based on the founder of Groovability, Joanne Fluke. TLC plans to air the documentary this summer. Keep an eye out for their foxy dance trainer, Aubree! Aubree Marchione and Nick Scott will be doing a special chacha performance on March 6, 2010 for Arnold Schwarzenegger at the Arnold Sports Festival in Ohio. Aubree and Nick originally met at 'The Arnold' in March 2009. There's no better way to celebrate their 1 year dance partnership than to perform for Arnold himself! 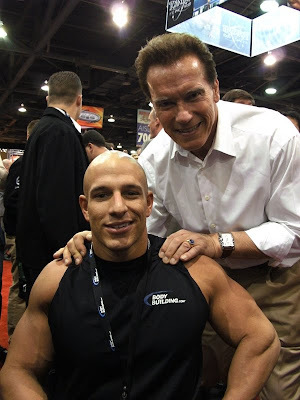 Above, Nick Scott and Arnold Schwarzenegger at the Arnold Sports Festival 2009. The Arnold Sports Festival is the largest multi-sport event in the nation.